Marion has to be one of the best female characters I have ever encountered, especially in a book of this vintage. Usually female characters this strong are evil, but Marion could stare down Madame Defarge or Lady MacBeth. Or in a modern book they turn into thin feminist mock-ups trying to be One Of The Guys, but Marion remains fully a woman and even a woman of her time. She doesn't wear a corset, but it's because she doesn't need one. Meanwhile the Count is--eww. Fascinating and charming despite his age, weight, and utter ruthlessness. An unforgettable villain. I was first intrigued by the way of presenting the book as a series of testimonies, as if reading a series of depositions. This grabbed the lawyer in me right away, but it worked well as a literary device, too, allowing the reader to look through different people's viewpoints in a natural way and piece together the evidence one step at a time. I see from the foreword that the author was a somewhat scandalous one in his day, and the book is meant to push at the edges of conventions. It is in following proprieties that Laura loses her fortune and endangers her life; it is through improper (though not immoral) means that justice is done. The author can critique society's conventions all he wants, but he cannot tell a rip-snorting good story without being moral, even moralizing. Good must prevail and evil be punished, and so it is. I have yet to FIND the book.I read it a long time ago but would prefer to read it anew before I post anything. I need to hit a used book store or two. So would I like it? Should I go ahead with it? I think so. I didn't like the tension at the beginning (when obviously Something Bad was about to happen) so I skipped ahead and read the last few pages. Bad me. But then I was able to read and enjoy the book despite temporary appearances once I knew how it all turned out. Once the bad stuff is past and it's just a matter of unraveling the mystery and seeing justice done, it's quite enjoyable. I read "The Moonstone" by Collins a few months ago and loved it. It was written in much the same style. I think Collins had a great sense of humor. 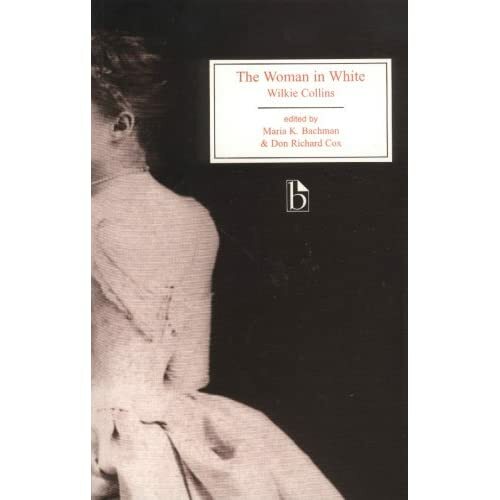 I'm planning on reading "Woman in White" this fall. I am far behind in reading for this month. I've read this book twice before though, so I roundly second everything you said. The plot twists and turns are well done. The writing is delightful, and I love the way the author uses the different narrators to convey totally different personalities (one of my favourite stretches was the part narrated by the crochety uncle). I remember reading somewhere that Wilkie Collins was considered the father of the modern detective novel, as he wrote the first mystery stories that required such careful unraveling of plots which hinged on crucial details. The Moonstone is also quite good, although it contains the same stock characters of vapid yet virtuous heroine, jolly decent well-intentioned hero who falls for the beautiful girl over the interesting one, and the like. Still looking for the book as well. I did start this book a year ago, but bogged down somewhere soon after the wedding took place. I have read the Moonstone, and very much enjoyed it. The butler and his references to Robinson Crusoe were an excellent touch. Telling the story through different characters was also well done. I was sceptical at first, but this technique provided more knowledge of events (helping you to solve the mystery:-)while not being too confusing with different narrative styles. I apologize for being so out of the loop. I was looking forward to this book, but unfortunately the reading schedule for it overlapped with my vacation with my husband, so I wasn't able to get it. I'm trying to get my hands on both books for next month, though, so I'll try to catch up. Carrie pointed me to your review. I included a link to your review at the bottom of my very brief comments on this book. I waited too long to write a decent review so am happy to include your comments which I must say I agree with!